Headstarted birds return to the fens! 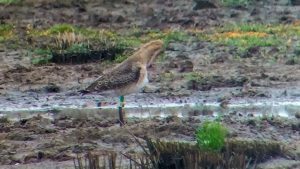 It’s been an exciting couple of weeks on Project Godwit as we welcome the first of our headstarted birds back to the project sites. We’re using headstarting to boost the population breeding at the Ouse Washes and fast-track the growth of this small population. Nine headstarted birds have been seen so far back in the fens this season. The birds have been keeping the team busy and we’ve been out surveying to find as many colour ringed birds as possible. Many of the birds that have returned are familiar to us as they were also seen in 2018, having been released at Welney in 2017. For most of the returning birds, this should be their first breeding season, so we’re looking forward to seeing what happens next. In this blog we introduce you to some of the birds that have been seen in recent weeks. Denver was the first headstarted bird to be spotted by the project team in 2019 on 22 March. He has been seen displaying over Lady Fen (the release site) and has been spending time with another headstarted bird, a female named Purl. Denver was one of nine released birds that returned to the project sites in 2018 and is from the same clutch as Remi and Nelson. Anouk was released in 2017 at WWT Welney. She was not seen at the project sites in 2018 so may have spent an entire year and a half in the wintering grounds of southern Europe and West Africa. Anouk was seen in the Netherlands on 27 March and just a week later was seen back at WWT Welney. Anouk is the sister of Benwick, another headstarted bird who has been seen back in the fens for this first time this year. Anouk has been spending a lot of time with Delph, another headstarted bird, so we will be keeping a close eye on them to see if they attempt to breed this year. Remi is another female from our class of 2017 but, in contrast to our other headstarted birds, she has decided to set up home at the RSPB Nene Washes. Remi is a well-travelled godwit and was spotted near Doel in Belgium last spring before returning to the Nene Washes, so for a time we wondered if she might abscond and join the Belgian godwit population. Female black-tailed godwits tend to disperse further than the males, though most birds recruit close to the natal site. Remi was seen last week back at the Nene Washes as is paired with an un-ringed wild male. We’re still waiting for the first of our class of 2018 to return to the project sites, however as these birds are youngsters, they may take their time coming back to the breeding sites (and some may not return at all this year). One of our 2018 released birds, called Hurricane, has been spending time at nature reserve near Valencia in Spain, and another bird, named Tom has been seen in Portugal. It’s always exciting when we receive sightings of the birds from the project, and we’d like to thank the birdwatchers out there for keeping a look out for these special birds. Perhaps Tom or Hurricane will make it back to the fens in the coming weeks? We’ll keep you posted! Posted in headstarting, migration2 Comments on Headstarted birds return to the fens! Signs of spring are well underway at our project sites in the fens and it won’t be long before the first black-tailed godwits return to the Nene and Ouse Washes. It will be fascinating to see how many of our headstarted birds are amongst them. Please keep your eyes peeled for any colour ringed birds – you can report your sightings to us here. Tom, pictured here in the rearing aviary last year has been spotted in Portugal. The godwits that breed at the Nene and Ouse Washes spend the non-breeding season at wetland sites in Spain, Portugal and West Africa. 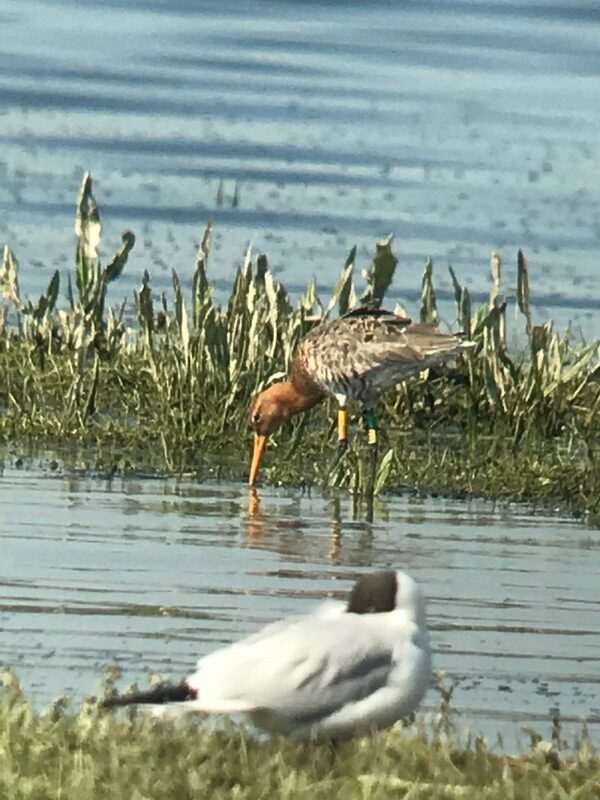 We were thrilled in early February to receive a sighting of young godwit, fledged from the Nene Washes in 2018 but spotted in Coto Donâna, Spain. This was closely followed by a sighting of Tom, a headstarted bird released at WWT Welney in 2018, wintering in Porto Alto in Portugal. Tom’s egg was collected from muddy farmland and hatched at WWT Welney on 19 May last year. We may see these birds back this spring, but often godwits don’t return to the breeding grounds until they are two years old. We’ve been busy over the winter making sure that the project sites are in the right condition for when they do return. 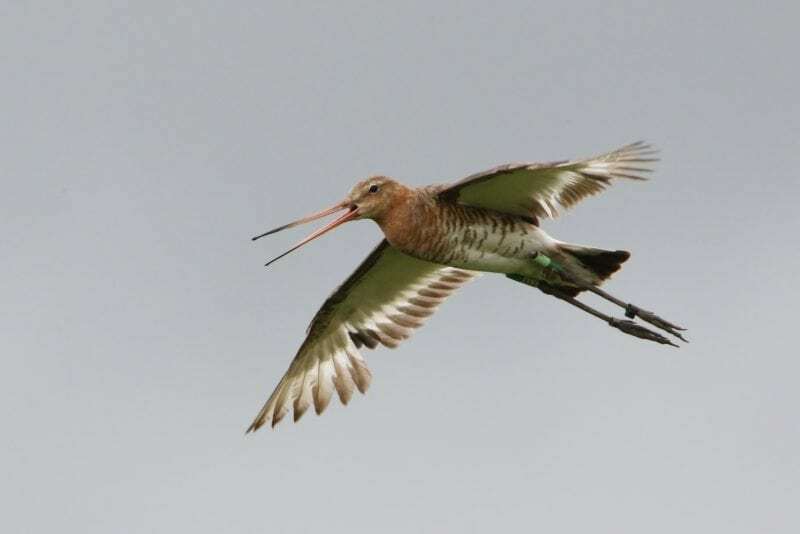 We’ve been monitoring black-tailed godwit nests and chicks for the last four years at the Nene Washes and we know that in those years predation has been the main cause of breeding failure. 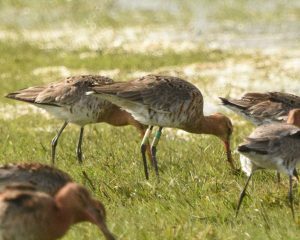 Through Project Godwit, we’re testing a range of measures to reduce the pressure of key predators on the black-tailed godwit population so that this fragile population can start to recover. One measure we’re trialling at the Nene Washes is exclusion fencing. We’ve installed a new barrier fence at the Nene Washes and will be monitoring its effectiveness. It will be interesting to measure the impact our fencing has on wader nest success in the coming months. If you’re visiting the site, please help us to keep the godwits safe by keeping the gate closed. If you are part of a school or community group in Cambridgeshire, Norfolk or Lincolnshire then you could get involved in Project Godwit by becoming a Godwit Guardian. 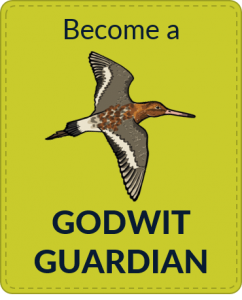 Becoming a Godwit Guardian is a fun, free way to get involved in Project Godwit. By linking you to one of the godwits, you will be able to follow your bird’s progress over the coming years, as they make a home in the Fens and head off each year on migration across Europe and Africa. 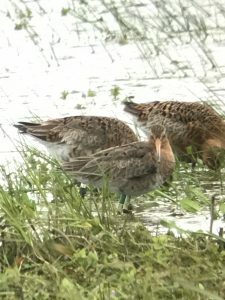 Your group, school or class’s name will then be put up on our website and you will also be sent a Godwit Guardian certificate and a profile of your chosen bird. To find out more about becoming a Godwit Guardian you can visit our webpage here. To see a list of birds looking for Guardians click here. It’s always exciting when we receive news of one of “our” black-tailed godwits, even more so when we receive three sightings in one week! Three of our headstarted birds have been seen this September and October in locations around the French coast. Ensuring that released birds are individually marked with colour rings allows us to monitor their progress. It’s great to learn that these birds are continuing to do well after their release. These birds are probably making their way south for the winter. Black-tailed godwits are migratory, and birds from the limosa subspecies spend the non-breeding season in wetland sites in Spain, Portugal and West Africa. So who has been seen and where? Pickles LN-L(E): Pickles is a male headstarted bird who’s egg was rescued from muddy farmland back in April this year. Pickles was released on 9 June at WWT Welney. He’s been spotted on two occasions at Porte-en-Re, on the west coast of France. 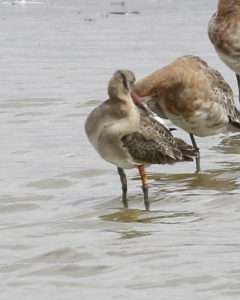 Caramel YG-WL(E): Caramel was released at the RSPB Nene Washes on 27 June this year alongside 14 other young godwits. She’s also been seen at Porte-en-Re, on the west coast of France. Budly OfO-WL(E): Budly is a male who was released at WWT Welney on 19 June. He’s been seen on the north coast of France, close to Le Harve. Three of our class of 2018 have been seen in France this Autumn. Although godwits are known to use sites in France throughout the non-breeding season, we’ve received relatively few re-sightings of birds marked here in the UK, until now. We are using colour ring sightings to build up a more complete picture of where the birds breeding in the fens spend their time away from the breeding grounds. For example, one of our breeding females from the Nene Washes has been seen in Senegal for the last three winters in a row. When she was first re-sighted in 2016 this was the first time a bird breeding in the UK had been spotted in West Africa. This breeding female from the Nene Washes spends the winter in Senegal. Colour ring sightings are fantastic, but they still only provide us with details of where are bird has been at a particularly point in time. To build a more complete picture of the godwits’ movements, we’ve been fitting some of the birds with geolocators. Geolocators are tiny light-weight tracking devices, which can be fitted to a leg-ring or flag. Using geolocators will allow us to build a more complete picture not only of the locations these birds are using, but also the schedule of their migration. It’s early days for this work – one of the difficulties of using geolocators is that you have to recapture the bird in order to retrieve the tag – but in the future we hope we will be able to compare the migratory behaviour of our wild and headstarted birds. RSPB Senior Research Assitant Mark Whiffin releases a bird after fitting a geolocator. None of this would be possible without the bird watchers and observers who spend their time looking for ringed birds. We’d like to thank everyone who has helped us keep an eye out for these special birds. If you think you have seen a godwit with a lime leg ring, stamped with the letter E, you can let us know about it here. 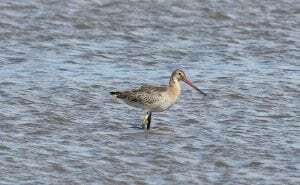 On this day in 2017, YO-OL(E), a breeding female black-tailed godwit from the Nene Washes, had recently arrived in West Africa, somewhere close to the Senegal and Guinea Bissau border. We know this because we were able to fit her with a geolocator at the Nene Washes, which was retrieved earlier this year, revealing her migration movements. Godwits are site faithful birds, so all being well she could be arriving in Senegal for the 2018 winter as I write this update. Our headstarted birds are also now moving further afield from their release sites. As the weeks draw on we expect that we’ll get fewer sightings of the birds as they make their way to the wintering grounds. 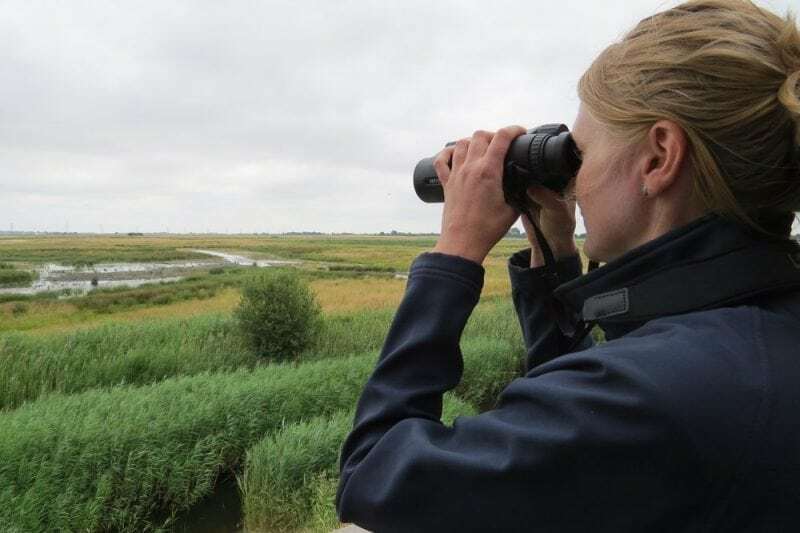 Our site teams are now focussing on ensuring that the Nene Washes and Ouse Washes are in tip-top condition for when the birds return next spring. We also have some time to reflect on the achievements of the season. With the breeding population in the fens now so small, every young godwit we can add to this population during the lifetime of the project is important. 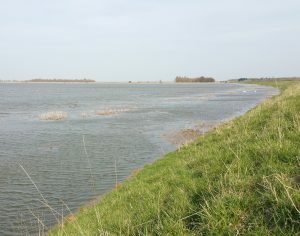 Early season flooding at the Nene Washes (see here) caused us some challenges in April when we had several pairs of godwits nesting in nearby farmland as the washes were underwater. Luckily, we were able to work with the farmer to monitor the birds and collect the eggs for headstarting. Many of the eggs were in quite poor condition due to mud, which can coat the pores of the egg and cause the developing chick problems. But thanks to the skill and hard work of our WWT aviculturists, most of the eggs did go on to hatch and we were able to release another 38 headstarted chicks at two different sites in the fens. Chopstick, released in June at WWT Welney and pictured here in July at Cley (Nigel Rogers). This summer black-tailed godwits bred successfully at the RSPB Ouse Washes for the first time since 2012, in habitat that has been expertly created with godwits in mind. We hope the birds have enjoyed their stay enough to return next season. 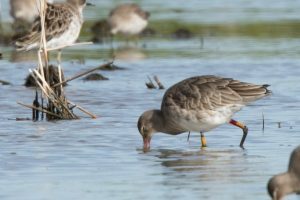 The icing on the cake was Earith, one of nine 2017 headstarted birds returning to the fens, who bred successfully at the RSPB Ouse Washes and reared a chick of her own. This year, the headstarted birds were also joined by 18 wild chicks from the Nene and Ouse Washes, the highest number of chicks fledging in the meta-population since 2013. This was a particularly satisfying result considering all of the challenges caused by the early season flooding at the Nene Washes. The site team had to work hard to resurrect our electric fencing following the flood, but the hard work appears to have paid off. We’ve seen a positive effect of our fencing exclusion trials, with higher nest survival in areas where our electric fences have been deployed. The number of chicks surviving to fledge was also much higher in 2018 than in recent years. Earith was headstarted in 2017 and bred successfully at the Ouse Washes in 2018 (Jonathan Taylor). As the birds head to their wintering areas, we can look forward to next year and hopefully seeing many more of these birds back in the fens. 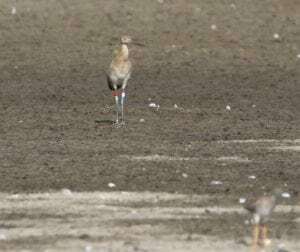 The highs and lows of the Black-tailed godwit breeding season. 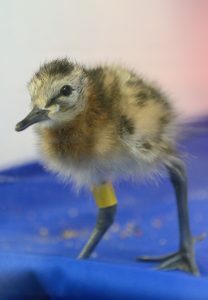 We are almost half way through the wader breeding season and what a rollercoaster it has been. 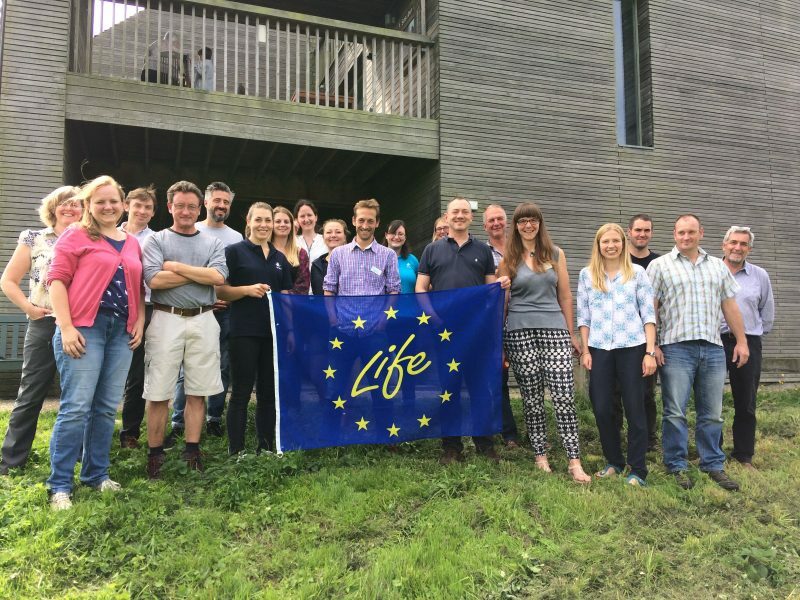 We started on some highs, with the return of Mark Whiffin as our Senior Researcher on the ground who was joined by Helen Jones, new to Project Godwit but not to wader research. The reserve team at RSPB Nene Washes had been very busy getting the habitat ready and the predator fences erected. So with the research team in place and the reserve looking fantastic, the godwits started to return and just as the first ones were about to start laying eggs, a huge amount of rain combined with high tides and the whole reserve went under water. This was a massive low point for everyone. What would the godwits do? Would they stay put and wait for the flood to go down? Or perhaps they would go looking elsewhere for flood free grassland? 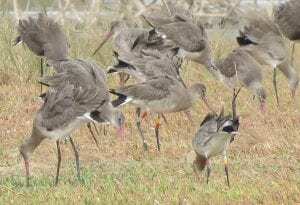 Well a small number did go elsewhere which is great news for the project because one of our aims is to have godwits breeding on flood free grasslands around the Ouse Washes. The majority stayed put and some did wait for the water to go down. BUT 11 pairs couldn’t wait and they unfortunately chose to nest in two crop fields close to the Nene. This was unfortunate because the wet conditions meant very muddy eggs and with the godwits frequently responding to predators in those fields, we feared it was not going to end well. 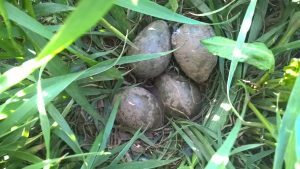 Fortunately for the godwits, the farmers who owned those fields were fantastic allowing us access to find and monitor the nests and then to collect the doomed eggs to be incubated, reared and released into the wild once fledged in the headstarting part of our project. We just hope that the muddy eggs are not adversely affected by the conditions they experienced before we collected them. Project Godwit is a 5-year project and this is our second year. 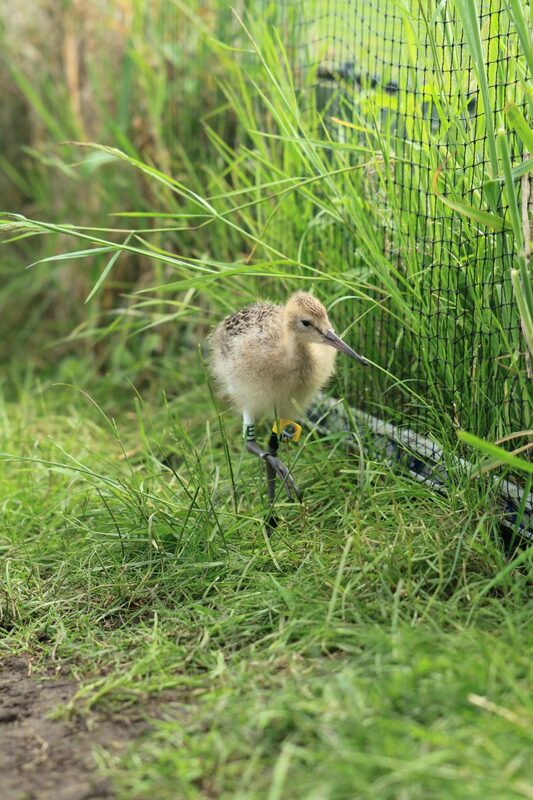 Last year, we reared and released 26 young godwits at WWT Welney. Most godwits only breed in their second year so we really did not expect to see many of our headstarted birds back on the Washes until 2019 although we did have reports of five of them during February on sites in Portugal and France. We have been absolutely blown away by the return of six of our headstarted birds especially given some of them look like they are going to breed and two of them are paired with each other (Nelson & Lady; see table below). What’s even more amazing is that five of them are siblings from two nests. We wait with baited breath to see if any of them breed successfully and of course to see who else returns with them in 2019. The flood water has largely gone from the main godwit fields on the Nene Washes so the research team are busy finding and monitoring nests of all waders but particularly the godwits as they lay second clutches to replace early failures and the early collections of eggs for headstarting. The reserves team have spent many days clearing the debris from the predator fences that have been under water and slowly but surely the fences are becoming functional and will hopefully protect many of the new godwit nests from predation from large mammals. Our monitoring will tell us about the success of this conservation intervention. So now we wait. How many godwits will hatch and raise young in the wild? How many of the collected eggs will hatch in captivity? Will the collected eggs be affected by the muddy conditions they experienced early on? How many of last year’s headstarted birds will breed and if so how successful are they? I will blog again later in the breeding season and hopefully be able to provide an answer to all of these questions. Dr Jen Smart is a Principal Conservation Scientist at the RSPB Centre for Conservation Science. She specialises in the ecology of breeding waders and mechanisms for reversing their declines. She is an expert at finding wader nests and her other field skills include bird ringing and radio-telemetry. 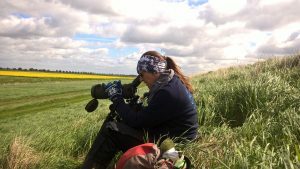 She leads the research team monitoring the black-tailed godwits during the breeding season at the Nene Washes. Well, what a wonderful week that was. 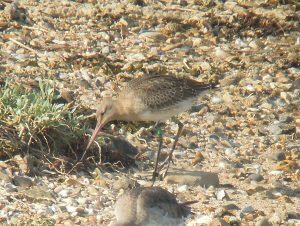 Yellow White Green Lime (E), named “Delph” by the Project Team becomes the first headstarted black-tailed godwit to return to the fens. Photo Louise Clewley/WWT. In June last year, we released 26 juvenile black-tailed godwits at WWT Welney in the hope that they would return to the fens in future years. Last Friday, we got some very exciting news. One of the headstarted godwits was spotted, in front of the main observatory hide at WWT Welney, just metres from where he was released. 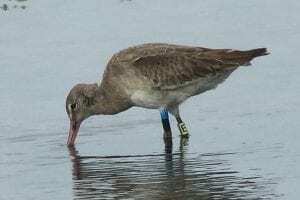 This special godwit – colour ring combination YW-GL(E) – has been named “Delph” by the project team, after the river which runs behind the area where he was spotted. Delph was last seen previously in February on the Tagus Estuary in Portugal. And then there were two! Another headstarted bird, “Nelson” is spotted by the team at WWT Welney. Then, in quick succession, another two headstarted birds were spotted. “Nelson” was seen showing well at the Nelson-Lyle hide at WWT Welney, and “Manea” was spotted over at the RSPB Ouse Washes. We weren’t necessarily expecting any of the headstarted birds to return this summer so this is a wonderful and welcome surprise. Black-tailed godwits don’t usually breed until they’re two years old, so we may have to wait until next summer to see if any of the headstarted birds attempt to breed. 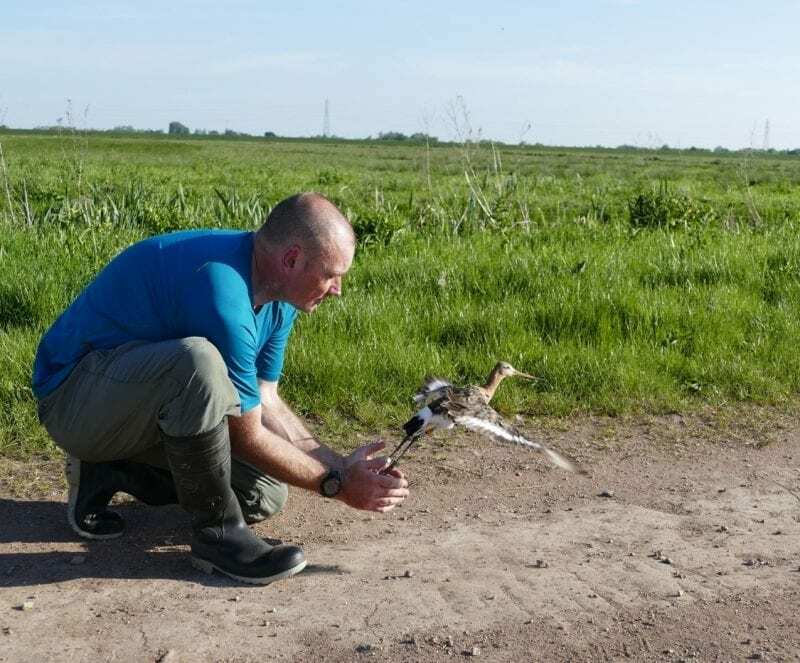 But nonetheless, this is fantastic milestone for the Project Godwit team, and we’re delighted that these birds have made it safely back to the fens. Interestingly, one of our females, “Remi”, has been seen in Belgium. Females tend to disperse further than males so it will be very interesting to see if she stays in Belgium and attempts to breed. 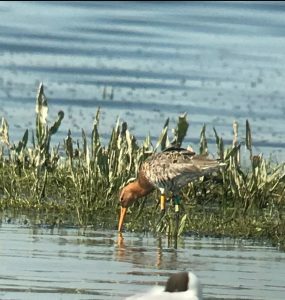 Last week we received the fantastic news that two of the young godwits released at WWT Welney last year have been spotted in Portugal. This is the first non-UK sighting we’ve received since the birds were released and marks an important milestone for the project. We’re delighted to hear that they have migrated safely, and it’s an especially happy moment for Nicky, Louise, Rosie and the rest of the WWT rearing team. The birds were spotted in large flocks alongside other godwits. This indicates that the birds are behaving as they should and the hope is that they will return to breed at Welney next spring, but because black-tailed godwits don’t usually breed until they are two years old we’re going to have to be patient before discovering if released birds will breed successfully in the fens. As well as the headstarted godwits, we received several sightings last week from Portugal of birds from the fens breeding population. This included one female (pictured below) who was first ringed as a chick in 1999 – making her almost nineteen years old! We’re looking forward to seeing her back at the washes this spring. For the third winter in a row, we’ve also received a sighting of female Yellow Red Red Lime (E) in Senegal, West Africa. 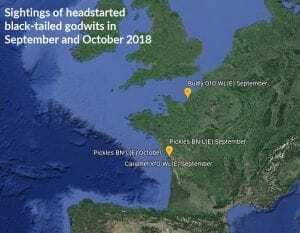 As the year draws to a close I thought I’d take the opportunity to reflect on the last twelve months of Project Godwit, and pick out a few of my own personal highlights. As we look forward to 2018, we know we have more to do to bring godwits back from the brink – but we’ll be working hard to give them a fighting chance. Released 26 juvenile godwits into the wild at WWT Welney. You can relive the moment the fledglings were released via the video here. Headstarting has enabled us to boost productivity (the number of chicks produced per pair) to one of the highest levels in recent years. 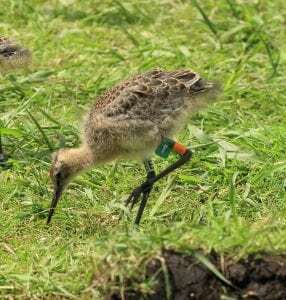 Fitted tiny geolocators (tracking devices) to sixteen black-tailed godwits. When we see these birds again in spring, if we can catch them, we’ll be able to download the data and find out where they’ve been spending the winter. Made the Nene Washes and Ouse Washes even better for black-tailed godwits – by creating wet features and pools. We’ve already seen many birds enjoying the new scrapes and we hope the godwits like it when they return in spring. 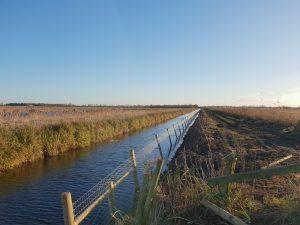 We also installed a new pump at the March Farmers section of the Nene Washes which will enable us to manage even more habitat for godwits in the breeding season. 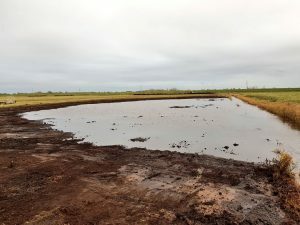 One of the new scrapes that has been created at the RSPB Nene Washes – photo James Cooper. Installed over 3500m of electric fencing at the Nene Washes to help protect nests from predators. We saw a significant increase in nest survival in fenced areas, but we need to fence more areas of black-tailed godwit habitat in 2018. Received a resighting of a female breeding bird (YR – RL(E)) from the Nene Washes from Senegal. What’s remarkable is that she has been spotted in Senegal for the third winter in a row. You can read more about her here. Introduced over 130 people to the black-tailed godwits through special guided tours at WWT Welney. Keep your eyes peeled for 2018 dates. I’d like to also take this opportunity to wish you a Merry Christmas on behalf of the team – and to thank the team for their incredible work throughout the year. I’d also like to extend this thanks to the birdwatching community who have been keeping an eye out for the godwits. Thank you very much for your support. It’s been a few weeks since you heard from us – the godwits have been keeping the team busy as we aim to keep track of their movements after release. Here’s an update on all the comings and goings from RSPB Senior Research Assistant, Mark Whiffin. Now that the busy breeding season is drawing to close, my attention is turning to the important question – where are the colour-ringed godwits? Time does have a habit of flying by at this time of year; it’s been five weeks since the 25 headstarted godwits were released at WWT Welney. It was amazing to see them leave their release aviary, settle on pools and begin to feed, as if they had always been there. We really had no idea what the birds would do after release, would they stay around the washes or just depart up to the coast? We hoped that they would initially remain in the relative safety of the Welney area and were excited to see that they did remain close to home, splitting in to small parties and touring the pools on the washes and on the adjacent WWT Lady Fen wetland, with some of the more adventurous birds exploring further to the RSPB Ouse Washes reserve. OG-GL(E) mixing with adults on the pools at Welney – image by Mark Whiffin. In the first days and weeks following release, WWT staff kept a very close eye on these special birds, accounting for all of the birds, noting their associations and interactions with other waders as well as their reactions to potential danger. Having been raised on their own away from adults, we were delighted that the youngsters started to mix with adult birds, feeding alongside them and hopefully picking up a lot of the life-skills they will need to survive in the wild. 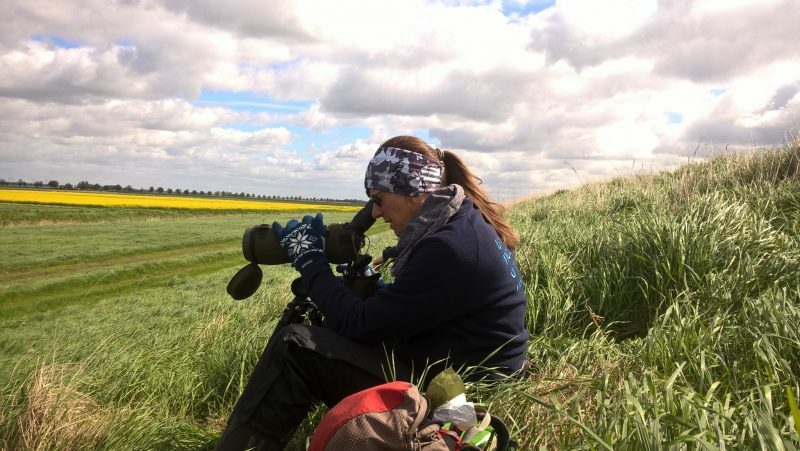 Visitors to Welney and the Ouse Washes have helped enormously in the monitoring effort by providing many more pairs of eyes to help us keep track of where the birds were. As time has marched on, some of the birds have taken their cues from the adults and started to depart the washes on the next leg of their journey. We owe a huge thanks to the many people who have reported sightings of these first adventurers. At the end of July we have a good idea of the extent to which the birds have dispersed. While there are still some birds on the washes, birds are being reported from further afield. The first to be spotted was WL-GL(E), she was found up on the Norfolk coast at Cley. She was followed shortly afterwards by LL-GL(E). He has amazed everyone; instead of flying north-east to the coast, he flew to the south-west and was spotted on the WWT Steart Marshes in Somerset! 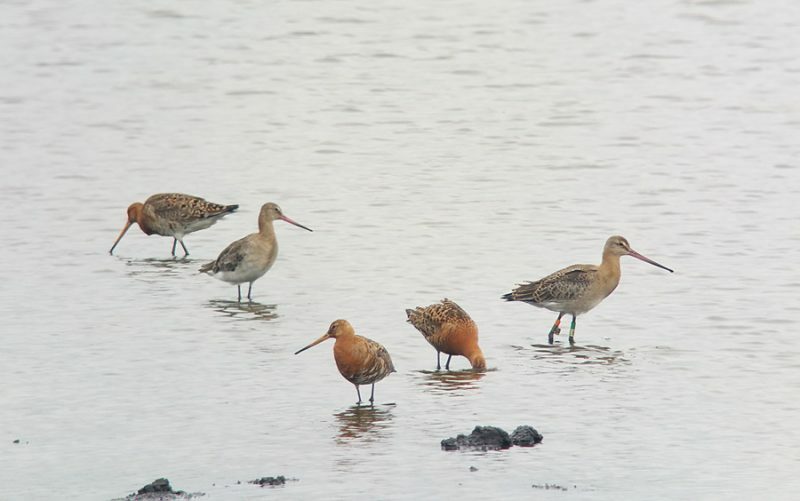 This is the first time a journey like this has been recorded for a UK-bred godwit. LL-GL(E) resting up on the Steart Marshes, Somerset – image by Joe Cockram. Further exciting sightings of headstarted birds have more recently come from Suffolk, with GG-GL(E) being seen at Trimley Marshes and both LN-GL(E) and OY-GL(E) being spotted at Old Hall Marshes in Essex and, in what is an even more remarkable twist to the tale, these two birds are actually siblings, I wonder if they know? We are delighted that five birds have been seen while undertaking the first legs of journeys which will hopefully see some of them fly all the way to Africa and perhaps return to the washes next spring. We are grateful to everyone who has reported their sightings. 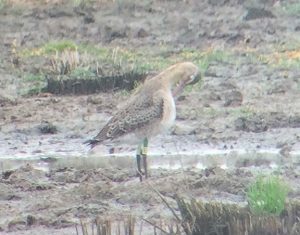 With other birds still to leave Welney and the washes, please keep your eyes peeled for other black-tailed godwits with the distinctive green and lime E rings on their right legs. Perhaps we’ll get a record from Spain or Portugal in the next few weeks and a winter record from African would be even better. We’ll keep you posted. Posted in headstarting, migration, monitoring2 Comments on Where are they now?